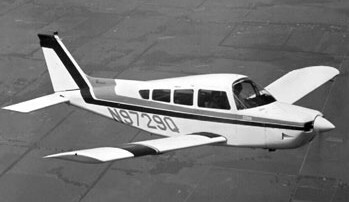 The Musketeer family was developed by Beechcraft as a lower cost and lower performance four seater than the Bonanza, intended to compete with the Cessna 172 and Piper Cherokee. Flown for the first time on 23 October 1961, the first of Beech’s “Three Musketeers” was introduced to the flying public in 1962 as the four-place, fixed gear, Avco Lycoming O-320-D2B 160-hp Model 23. First production aircraft were delivered in autumn 1962 at an initial price of $13,300. The Musketeer wing introduced bonded honeycomb construction to the lightplane market. Only the first Musketeers had full-swiveling nose wheels, the rest are steerable 15 degrees each way. More than 500 of these 23s had been sold when a redesigned model, the A-23, went into production in 1964. The A-23, powered by a 165-hp fuel-injected Continental IO-346-A engine, had an increased landing flap angle and a restyled interior. This Musketeer became the Musketeer A23A Custom III in 1966 (Avco Lycoming O-360-A4J 180 bhp / 134kW) when it was joined by the two-seat (optional four-seat) Musketeer A23-24 Super III (Avco Lycoming 112kW) and the Musketeer A23-19 Sport III (Avco Lycoming 150 hp). The Beech 19 was introduced as a 1966 model year with a standard price of $11,500. Despite having a lower model number, it was a later variant and was a lower-powered trainer version of the Model 23. It lacked the 23’s third side window and had a Lycoming O-320-E2C powerplant of 150 bhp (110 kW). 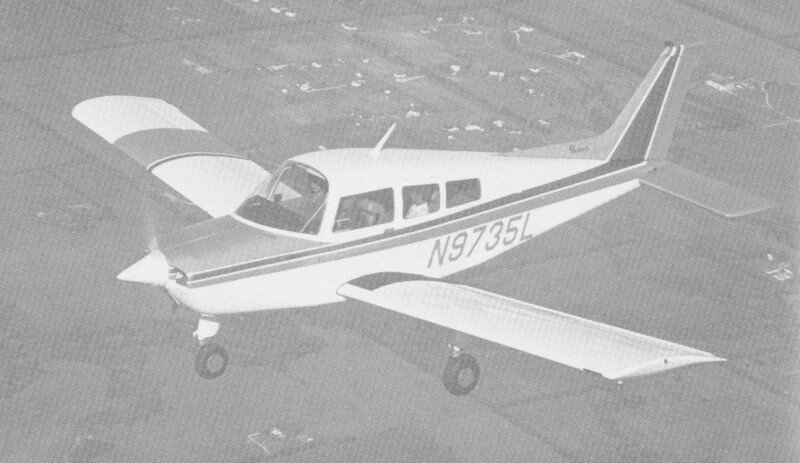 Along with the introduction of the lower-powered Model 19 in 1966, Beechcraft also introduced a higher-powered version of the Model 23 Musketeer and named it the Beechcraft 23-24 Musketeer Super III. This upgraded model had a Lycoming IO-360 fuel injected powerplant which produced 200 bhp (150 kW), 35 hp (26 kW) more than the standard Model 23 Musketeer of that year. This model initially sold for a price of $16,350 in 1966. The fixed-gear Model 23-24 was produced only between 1966 and 1969. A total of 369 Musketeer Super IIIs were completed before it was superseded by the Model 24 Sierra. These were serial numbered MA-1 to MA-369 and were the only models to have a "MA" serial number, making them easier to distinguish than other members of the Musketeer line. In the last few airframes of the series a new instrument panel with the same "vertical tape" gauges that were used in the early Sierras was introduced. These models were known as the A24 and are not to be confused with the first Sierras, which were designated A24R models. Other than the instrument panel these aircraft were mechanically identical to the earlier A23-24 model. In 1966 a single demonstration Model 23-24 was equipped with a constant speed propeller. In succeeding years approximately one third of production aircraft were delivered with the constant speed propeller. The Model 23-24 Musketeer Super III proved the utility of the 200 hp (150 kW) engine in the Musketeer airframe, with six seats optional, a constant speed prop, but the fixed gear configuration prevented using full advantage of the extra power of the injected Lycoming. The obvious solution was retracting the landing gear and this resulted in the Model 24. In 1970, Beech redesigned the Musketeer fuselage, giving it a more rounded shape, and adding four and a-half inches across the front seats. Windows were re-shaped, with the 150-hp B 19 Sport retaining two on each side, the Custom and 200-hp Super with three. The 1970 and 1971 Supers were offered with a fourth cabin window as an extra-cost option, along with an additional bench seat in back, making them six-placers sort of. The Super was discontinued in 1972 (replaced by the retractable-gear Sierra). Christened the "Sierra", the first model year for the new retractable version was 1970. The initial A24-R Sierra Super R was powered by a Lycoming IO-360-A1B of 200 bhp (150 kW) and sold for a standard price of $24,950. The Model 24 completed the Beech line between the fixed gear Musketeers and the much larger, faster, more complex and expensive Beechcraft Bonanza. Both models were continued through 1971, when the fixed-gear model was dropped. As part of the Aero Center line, the 200-hp retractable version became known as the Sundowner. The name changes and the “cleaning up” of the Musketeer line was all part of a major corporate redirection by Beech management to devote more attention to the small airplanes. Beech Aero Centers were set up around the country, franchised just to sell the Sport, Sundowner and Sierra. More recent Sierras benefit from increased useful fuel, an optional autopilot, a larger diameter propeller, and wheel well fairings. The result is increased range, a greater rate of climb, and a higher cruise speed and service ceiling. The Lycoming engine of 180 hp (130 kW) started with the B23 Musketeer Custom of 1968. Optional aerobatic kits were also available for the Musketeer Custom and Musketeer Sport when flown as two-seaters. A fourth version was introduced in late 1969: known as the Musketeer Super R, it was basically the same as the Musketeer Super but incorporated retractable tricycle landing gear. 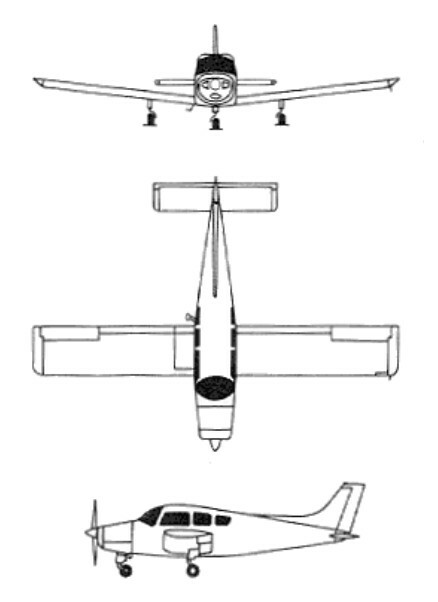 In 1970, Beech redesigned the Musketeer fuselage, giving it rounded sides and more cabin room. The panel was improved extensively and a third side window was added, and the models were renamed Musketeer B19 Sport, Musketeer C23 Custom and Musketeer A24 Super. The 1970 and 1971 Supers were offered with a fourth cabin window and a bench seat in the back for six seats. In 1972, the name "Musketeer" was dropped, and the fixed-gear models remaining were the B19 Sport and C23 Sundowner, with 150 and 180-horsepower respectively. These continued in production through 1976, with 1977 list prices of US$22,000 and US$26,450. Late in 1973, an AD Note was issued by the FAA restricting spins in the acro version of the Sundowner. 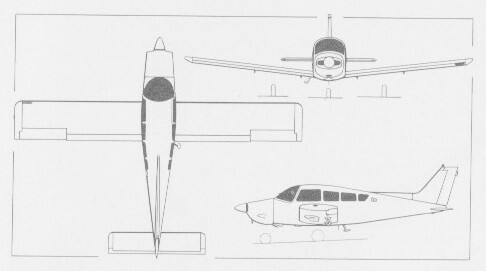 While there's some question as to the legitimacy of those complaints, Beech added small fences or strakes on each side of the cowl and on the stabilator's leading edge to disturb the airflow over the tail on the aerobatic versions of the Sundowner, and this presumably satisfied the FAA. Another AD requires inspection of the forward wing attachment brackets (for possible cracks) on these airplanes. The Musketeer name was dropped in 1971 and a further renaming took place. The Custom became the Sundowner C23, the Super R became the Sierra A24R, and the Sport became the Sport R19 and production of the Musketeer Super was discontinued. Like other models, the Sundowner is also available with an autopilot and its useful fuel has been boosted to 57 gallons. This extra gasoline translates into greater range and 30 pounds of additional useful load. The Sundowner is equipped with a fixed-pitch propeller and nonretractable landing gear. An Aerobatic ver-sion is offered which is approved for rolls, Immelmann turns, loops, spins, chandelles, etc. When properly equipped, the A19, B19, and M19 Sports are approved for limited aerobatics. A total of 922 Model 19 were built over the 15 years of production which ended with the 1979 model year. The Sierra was given a new cowling, quieter engine and more efficient prop in 1974, and various aerodynamic changes were made to the Musketeer family in 1977. Sport manufacture ended in 1978. The Sundowner 180 and Sierra 200 remained in production into the 1980s, with series production ceasing in 1983 after over 5,000 had been built. The main difference between the Musketeer line and other similar light aircraft is the Musketeer’s undercarriage. While the competitive Cessna 172s use sprung steel main gear, the Piper PA-28 Cherokees use oleos and the Grumman American AA-5s use fibreglass sprung main gear, the Musketeer family use a trailing idler link gear system with a compressed rubber puck suspension system. This gives the aircraft quite different landing characteristics compared to the competition; light touchdowns are often accompanied by the idler links skipping and producing a less-graceful than anticipated landing. Used by the Canadian Armed Forces as the CT-134, Musketeers have been delivered for civil or military training use to Algeria, Indonesia and Mexico. Span: 32 ft 9 in. Height: 8 ft 3 in. Max speed: 127 kts / 146 mph. Cruise 75% pwr: 118 kts / 137 mph. Stall: 54 kts / 62 mph. Wheel base: 11 ft. 10 in. Wheel base: 6 ft. 4 in. Overall length: 25 ft. 9 in. Wheel track: 11 ft. 10 in. Fuel capacity opt: 57 USG. Stall: 52 kts / 59 mph. Initial climb rate 792 fpm. Wing span: 32 ft 9 in. Fuel flow 65% power: 7.6 US Gal/hr. Power loading; 12.25 lbs / hp. Wing Loading; 16.08 lbs / sq.ft. Max Level Speed; 131 kts / 151 mph. Cruise 75% power; 125 kts / 143 mph. Stall: 52 kts / 60 mph. Initial climb rate 820 fpm. Takeoff distance (50’) 1130 ft. Landing distance (50’) 1484 ft.
Cruise (75% pwr): 151 mph. Prop: Hartzell 2 blade, constant speed 76 in. Max ramp wt: 2758 lbs. Max landing wt: 2750 lbs. Max useable fuel: 343 lbs. Fuel flow @ 65% power @ 8,000ft: 54 pph. Endurance @ 65% power @ 8,000ft: 6.1 hr. Rate of climb @ 8000 ft: 500 fpm.